As part of its fundraising efforts, the Pryor Mountain Wild Mustang Center has commissioned celebrated artist T.D. Kelsey to create 20 bronze sculptures featuring wild horses. 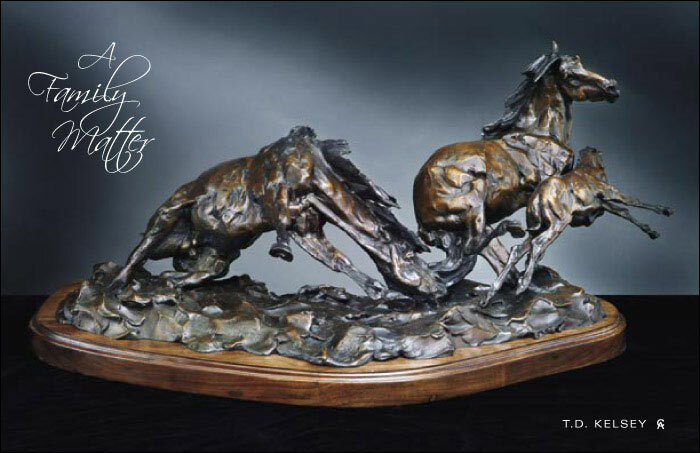 Entitled “A Family Matter”, these 30″ x 20″ x 14″ sculptures show a stallion snaking his mare and foal away from danger. Each signed and numbered piece is available for a donation of $10,000, $8,000 of which is tax-deductible. Along with helping the Center accomplish its goals, funds raised through these sculptures will also go toward the creation of a 1 1/4 times life size version of the sculpture that will be displayed at the Center’s museum building.